Need a healthy alternative for a lunch meeting? Our fresh salads are the perfect option to keep your team energised and on the ball. We offer a large selection of small, medium and large salads made to order and available for next day delivery. Flavours Catering can provide salad catering and save you time doing it! Simply order online and we can confirm the order for you! 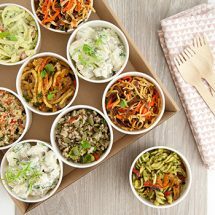 Choose from four different size options and ensure that your team is eating a fresh and nutritious lunch the next time you have a last-minute meeting to cater. People say “you don’t make friends with salad” well, I guess you haven’t met our salads yet. Fresh, healthy and nutritious; our salads are the perfect option for the health conscience and anyone with dietary requirements. Thinking of ordering a mix of sandwiches for you next lunch meeting? 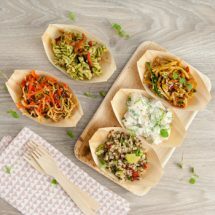 Why not team them with a selection of low carb and delicious salads. They are available in small, medium, large individual boxes as well as platters for all to share. Need to organise an easy to eat, quick and on the go lunch for those days out of the office? Simply order online with Flavours Catering by 3 pm the day prior and you will have lunch waiting on your desk when you arrive at 9 am. Be sure that the meal you are providing your staff is the healthiest option out there. 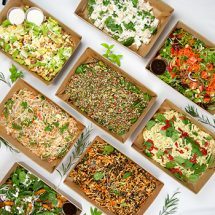 Our salad boxes are packed with loads of healthy ingredients that will guarantee your team skip that ‘3 pm slump’ and sugar craving. Just log onto our website, select the flavours you would like and watch your staff power through the afternoon without a second thought. Struggling to find lunch options which will suit everyone’s individual dietary requirements and health kick must and must nots? 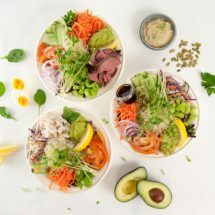 Flavours Catering + Events has naughty and nice salad options that will please low carb, vegan, vegetarian and many other diets. Just ask our friendly staff online and they can help you select the perfect menu.